Looking back over this year, having the time to spend in reflection of the many decisions made – some seemingly very minor, having small impacts to others which were major decisions that have had over-arching impacts – the road way has been paved with each of them, interlocking with others in some manner. Some of those decisions have yielded an outcome most favorable, while others have been difficult in a few places – not clearly being able to distinguish whether it was really better or in some manner for the worse for one reason or other. Each of our decisions will have an impact on others, either in a positive manner or in a negative way – it is a consequence of our choices and the actions we carry based on them. As a Christian, our Victory is already SECURE!!! But, we have to remember that each step of that road will be paved as we walk it, live it out, ask our Heavenly Father for help to carry through and listen to the Holy Spirit guide us along our everyday lives IN the Relationship we have IN Christ. Those four words are crucial for each of us to recognize and realize the importance they present. Each decision that we make in life will have an element of each of them as a concept or basis, our Lord doesn’t play tricks with us – His Way is paved by Truth and Light – in Him, by Him, for Him. He provides the opportunity for us to do so with Guidance – by the Holy Spirit. A manner or way to look at those four words would be the following… As we move through life (the walking), we choose to participate or to ignore/go around events, people places (the live portion), where we can seek help from our Heavenly Father, or go it alone (the ask or talking) and make a choice to follow (to listen) the direction provided us by our staying in commune with our Saviour – exercising our Relationship with Christ, or of course be in rebellion… not depending on Him at all. Paved | Paved is the placement of events, circumstances and happenings as prepared passage is made by way of our Heavenly Father. Faith | Faith is an affectionate practical confidence in the testimony of God. Trust | Trust is placing our confidence and reliance upon the Word of God to complete what He has promised. There are many things that are presented in our lives with which we walk among, but there is a manner in which we can walk that is best – those items will be ones that help each of us as Christians be close to our Saviour. The most important of those is Faith and Trust, which built upon a firm foundation of the Word of God – not the worlds idea of making it to the end. 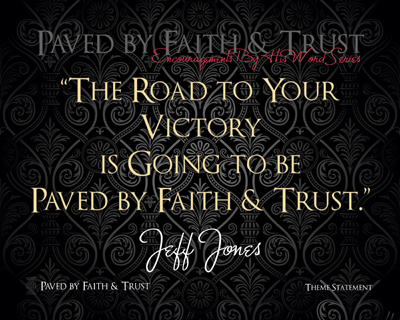 There is Victory for the Christian along life’s way – here are a few of the pavers. Moment by moment, day by day, we live in world made up of decisions which pull and tug at us in a vile attempt to put ourselves on a broad road – one of destruction, humiliation and sorrow. Many will NOT see or understand, blindly following the world, examining the “paved” road that they walk upon – often marking it in places of trial and despair. Sadly, there are even more who upon seeing others “paved” way will celebrate and remember just those small snippets of time, hanging on to those as rewards in life. I’m here to share with you that our Road does NOT have to be like that AT ALL! We have full access, as Christians, to Victory – made possible by the Blood of Jesus Christ – Who we can place our FULL Faith and Trust, for He has ALREADY paid for the Victory. Each one of us will take different steps, but the Road is the same, as is the Saviour we MUST Trust to get each of us there. Can others see Victory in your life today? In even the worst circumstance that we can imagine, will we have a clear testimony of our Faith and Trust in the Lord? Just this past week our family has seen it, shown it and shared it – it is my daily desire to exercise my Faith, to place my full Trust in Him and have others see my road I live Paved with the Goodness and Grace of God. In a day and time where so much is being themed around “Let it go…” from Disney’s blockbuster movie Frozen, have the Redeemed of God thought about what they should be singing? Of course, everyone of us like a chipper, uplifting song that is meant to Praise, show Adoration and extend our Worship as enabled by the Holy Spirit. The challenge that is found too much of the time is that Christians have no more idea what the lyrics are of the song they are listening to than any other secular genre of music. Even more surprising than that fact, is that oftentimes the songwriter doesn’t realize the loss of potential impact they may be having with those singing/performing their music because of a VERY loose basing on Scripture of the written lyrics. Each of us of course have to realize that not every lyric has to be a full sermon, but if it is Bible based, then it should be biblical, right? Each day my routine includes a mix of recorded/written sermons, Christian music, Christian music videos, biblical based helps, Christian based blogs and research on hymns – including collecting sheet music for them. It makes my day start of well and continues to set the tone for everything that is done – the impact is “global” – touching everything that is done. It is a rich impact, which carries over into the phone calls that are taken and made, e-mails that are written, interactions made with staff at the office, responses to a team of wonderful doctors who have yet to figure out how one can be so chipper and spirited during times of trial and pain… None of those things are by accident – it is a realization that I’m Redeemed and I know that WITH my Saviour, every triumph, every struggle, every good thing, every trial… He PAID the Price of Redemption that is FOREVER settled in Heaven, nothing less than my full Adoration of Him will do. A song based on the same title from Psalm 107:2, Let the Redeemed of the Lord Say So, performed by The Hoppers is my absolute all time favorite rendition of that song. They give the words a melodic lift that is akin to causing one to want to SHOUT unto the Lord in Worship to the Heavenly Father through song – and wake a few folks up around who are sleeping at the same time. The energy they bring is incredible, uplifting and powerful – which if that doesn’t get you stirred up, Heaven is going to be a REAL interesting place for some when they get there. But, that is where I really think a tragedy exists, one that is all too often overlooked, swept back away from view of others and maybe even hidden so it cannot be seen… If, just if, people would realize something that is so counter-culture today, not all in life is a stand up and shout, perfect and balanced reprisal – life can be VERY difficult, painful and full of tragedy at times. It is in those times when one can truly hear the heart of an individual will understand the biblical meaning of “Let the Redeemed Say So…”, when it is poured out from the very depths of a persons soul, building to an outpouring of the heart in a pitch completely in tune with our Creator, our Heavenly Father, God. Just as the bloom in this photo shows, it was tucked up under a covering in the bushes where it was photographed – all beautiful, delicate and full – requiring a trained eye to even spot it with just a hint of sunlight hitting it. Just because it was hidden, didn’t mean it didn’t exist, nor does the factor that it wasn’t out in the open declare or renounce its beauty. Our Heavenly Father sees us for who we are and knows our worth to Him. Wherever we find ourselves, we can Praise and Thank Him as fellow Believers in Christ. Our Heavenly Father wants to hear from us and desires that we stay in sweet communion with Him. In the event we don’t do so, He also loves us enough to exercise an opportunity to get our attention so we might better understand His Love for us includes Correction. I’d personally rather NOT have to have all the gathering times after the falling away times as in Psalm 107, but am THANKFUL we have a Merciful and Gracious Heavenly Father Who is Willing to Look after each of us. This Series has a total of nineteen (19) images from eighteen passages of Scripture, including the Redeemed foundation verse in Psalm 107:2 and definitions of the words: Redeem, Salvation and Understanding, as well as a few Ways the Redeemed can Say So. This Series has been a deep look into the Redeemed, that is the Christian, and how we can as Redeemed Children of the King can know how and why we need to Say So to Him. We have a REAL enemy, who has a REAL agenda, with NO concern for our well-being or real soul-concern. People may think that this was just an Old Testament “challenge” or “problem” that doesn’t exist today – that is a TRAGIC mistake in their thinking for that enemy has more sway today than he has EVER had. 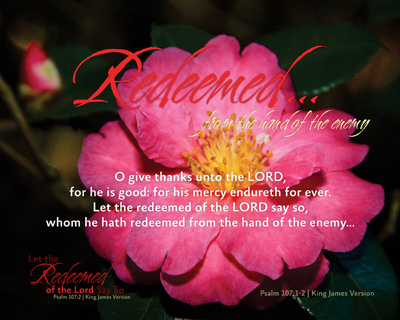 There are those around us who NEED to HEAR the Redeemed of the Lord Say HOW GOOD and HOW GREAT He IS – TODAY!!! When we give THANKS to Him, whom He had DELIVERED from the hand of the ENEMY – may they clearly see that His MERCY Endureth For Ever! In thinking about how “good” a person is for me, you or someone we may know, all we really have to do is peel back what kind of an effect that person is having on them. While that is certainly not the only factor to consider, it does give us a place to start. If that individual or individuals are “no good for you” as the saying goes, we should be a faithful friend who is willing to say so in a loving, kind and considerate manner – the sooner, the better. Could not the same thing be applied in the matter of God’s Goodness to us? Are we willing to share His Goodness with others so they will know Who God. the LORD, is? How else will they hear? The world is riff with programs, events and activities – just to mention a few, trying to persuade even the most balanced Christian into taking their eyes off the Bible as a foundational book for Christian Living. The more we will keep ourselves immersed in the Living Word of God, the more we will find that His Word is True, Applicable in our world and Shows up in our everyday living. Then and there comes the question, who is willing to tell them? Not only through my life (that is a GREAT place to start), but through my deeds, actions, words, time spent and study, but also counsel, devotion, teaching, worshiping, praying and sharing. We have SO many things to Praise Him for, especially those of us who have the opportunity to teach children. The lives of those children will largely reflect what they see in the adults around them – it is my desire to have that reflection be clear, genuine and full. Each of us as Born-Again Christians have a testimony, which is His Goodness directly applied to our lives for Eternity. When something Good happens to me, it is pretty difficult for me to keep silent about it – and YOU??? 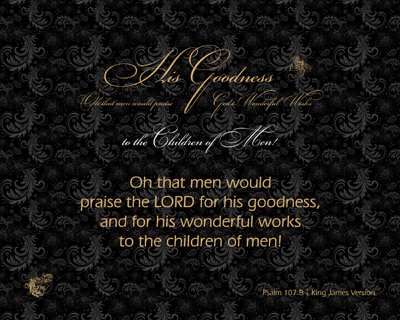 Oh that we would be those that would Praise Him, Praise Him! There are seventeen (17) direct derived statements gleaned from the verses of Scripture used in this Series to describe His Goodness and Wonderfulness towards us. Just by looking at the poem that this Series is based upon, the theme should be very quick to pick up on and the thought process easy to develop – which is why this Series needed to be developed. We all can do that to some level or extend, but I’ m afraid that is where the problem can become the problem. The study time for this Series was amazing and the time spent digging for simple, relevant nuggets kept expanding. After combing through literally hundreds of verses, which made up hundreds of passages to get them in context, found myself immersed with peoples lives, actions, reactions, warnings, rewards, penalties and MANY life “things” – many of them fantastic passages, while clearly only a few of them became nuggets. Those simple, straightforward multi-verse combinations were then easy to see, for they stood right out from the others very simply. Each of the practical passages of Scripture presented in this Series are multiple verse selections that present a very profound Truth and Instruction from the Word of God, His Spoken Word, the Bible. From pouring over 44 books of the Bible where the passages ultimately appeared, only five (5) books contained the eight (8) presented – six (6) being from the Old Testament (OT) and the remaining two (2) from the New Testament (NT). 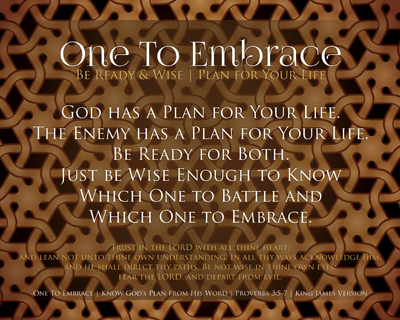 They are simple, yet VERY powerful presentations to Christians of how we can know from which Person those Plans come. We are challenged to test them against God’s Word – for indeed that is where ALL of these Instructions have originated and are directly gained from. We are instructed to TRUST first, Acknowledge Him, THEN follow His Direction, Fear the LORD and DEPART from Evil. The very first step is critical and foundational – we must first TRUST Him. All of those “other” things will naturally follow once we have that key element nailed down and of the right priority.